We headed out, again, for the Szechuan Noodle Bowl and this time it was open. The window lures were faded, but were enough to build a some excitement in the MSG150 group as we entered. We were a large group for such a small place, but got there early enough that they were able to seat us all at one table without a wait. Where is the owner/chef from? : Husband is from Chongqing and wife is from Shanghai. I finally found one: I'm going to rate this place a 5. The atmosphere here is stunning. I grew up in rural eastern Washington, so I'm no newbie to plastic horsies (90% of the girls in Deer Park are "the crazy horse girl" from your high school). Apparently the owners of Szechuan Noodle Bowl aren't newbs either. The pictures on the wall of plastic horsies really class the joint up. 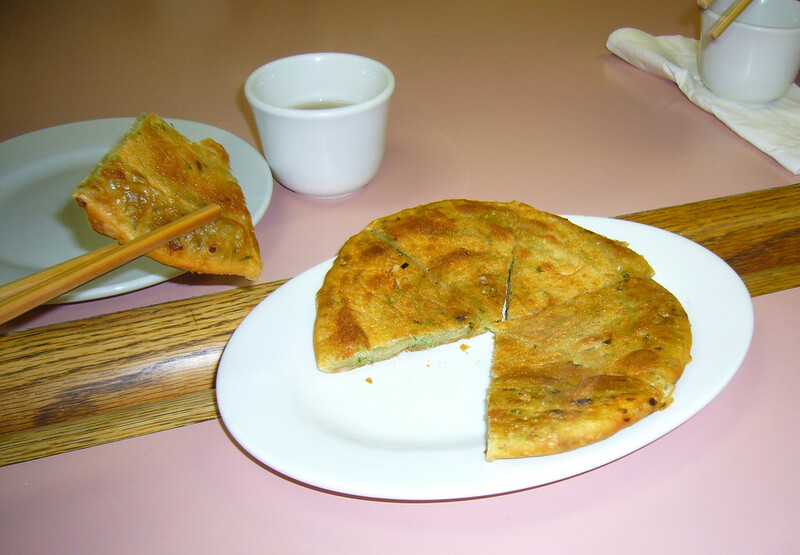 The starters: Green Onion Pancakes. There were eight of us, and the pancakes were cut into six slices... therefore we had to order two of them. This was a $3 treasure. I sacrificed myself, and decided that I wouldn't eat a piece of the first pancake. When the second pancake came out, I ate my piece like an addict eats crack. I'm recalling all of the flavors right now. Flaky and savory dough. Fresh from the pan warmness. Mild but "present" onion flavor. I'm pretty sure that the next time I go to Szechuan Noodle Bowl, I'm just going to order a short-stack of these. After devouring through our first appetizer, we were all thanking our respective gods that we had also ordered the Dumplings with Hot and Spicy Sauce. The filling in these dumplings was p-e-r-f-e-c-t. Firm enough maintain its shape, but soft enough that you don't feel like you're eating Pb (Thats lead). 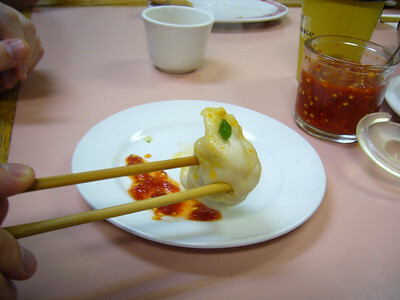 On the second bite of my dumpling, I scooped some of the Hot and Spicy sauce into my dumpling. Jackpot. The sauce is tangy, spicy, and all sorts of awesome. Because almost everyone else was ordering the Szechuan Beef Noodle, I decided to get something different: Original Beef Noodle with Soup. Basically, a less spiced version of the Szechuan Beef Noodle with Soup. The most obvious difference between the two is the color of the broth. Mine is mostly clear with a yellowy-brown tint. The Szechuan version was so dark that you couldn't see the bottom of the bowl. The bowl the soup comes in is kind of small, but amazingly filling. What I found most amazing about this soup was the tenderness of the meat. The meat was soft and completely not stringy! Awesome atmosphere. Amazing food. Low Prices. Nice Service. The Szechuan Noodle Bowl is not much to look at, but what it lacks in atmosphere, it more than makes up in tasty goodness. The small restaurant has very basic furnishings and decor including, oddly, large artful photos of plastic toy horses. 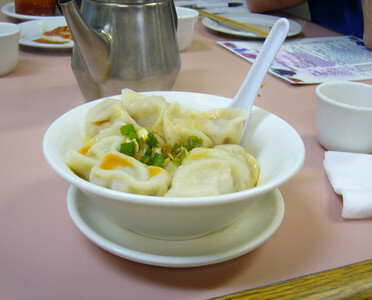 In addition to each of us ordering a noodle soup, we also ordered Green Onion Pancakes and Won Ton in Hot & Spicy Sauce for the table to share. Both were exceptional. The pancake was rich and flavorful and served just seconds after it was pulled from the griddle. The Won Ton were outstanding. The dough was meaty (in a good way) and clearly handmade. The filling was well seasoned and firm. The dumpling trinity was rounded out with a tangy and spicy sauce that brought the tastes and textures together in delicious harmony. I ordered the Szechuan Beef Noodle with Soup which came out of the kitchen first. I could hardly contain myself trying to be polite and wait for others to be served. The broth was amazingly rich. It was like liquid spicy pot roast. The beef chunks were tender and not at all stringing. The bok choy was fresh and crisp. It was a perfect beefy concoction. The Szechuan Noodle Bowl is #1 for me so far in the MSG150 quest and I am torn between giving it four or five chopsticks. If we allowed half ratings I would split the difference. I am tempted to hold out five chopsticks only for perfection, but I fear if I do that I will never rate anything a five. So the Szechuan Noodle Bowl earns from chopsticks from me. I was pleasantly surprised Szechuan Noodle Bowl. Both the exterior and the interior are very unassuming, so at first glance, there's not much to talk about. They have pictures of fake horsies on the wall. They claim all their food is made fresh and from scratch. Their menu is also short and with a limited set of options. We ordered the green onion pancake and 10 dumplings in hot and spicy sauce to share. The pancake was good, the dumplings were out of this world. They were piping hot, spicy, flavorful, and awesome. I think next time I might make a whole meal of the dumplings. For the main course I went with the Szechuan Beef Noodle with Soup. 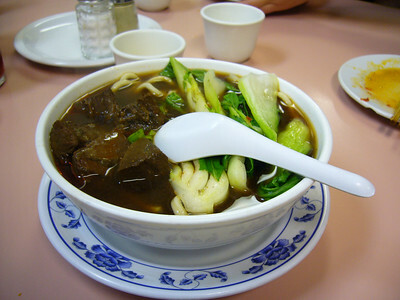 The broth was dark and rich with beefy flavor. The beef itself was like pot roast, and was very tender. The noodles were roundish flour/egg noodles, and had a nice flavor and consistency. They added some hot to the soup so it had a nice spicy tasty, but not overwhelming. The spicyiness mixed with the beef reminded me of pepperoni, in a good way. Overall, very good lunch. I'll definitely be back. this place is a definite keeper. the appetizers were very good. the pancakes were thick and savory, and the sauce on the dumplings had a nice tanginess that was a good foil for the pork filling. we made a rookie mistake: finishing the pancakes before the dumplings came meant that we didn't have pancake left over to sop up dumpling broth. never again! 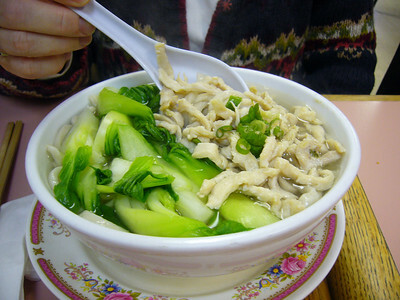 the bread-and-butter here is clearly the szechwan noodle bowls. which if you think about it is a pretty convenient coincidence, given the name of the joint. 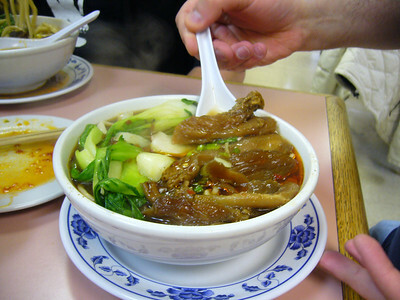 mine, the szechwan beef tendon version, was spectacular. 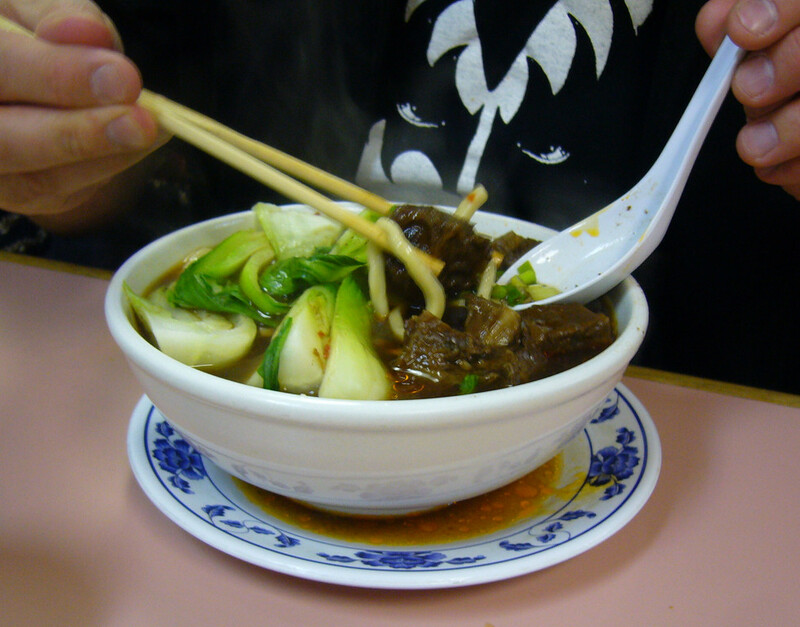 the broth was unbelievably rich and beefy, and the spiciness was spot-on. i'm a sucker for thick flour noodles, and these were fantastic, soft like udon; they were almost more like dumplings. last but certainly not least, the tendon was soft, rich, and gelatinous. for me the bottom line is this: if you're going for noodle soup in the ID, pho is the default choice. 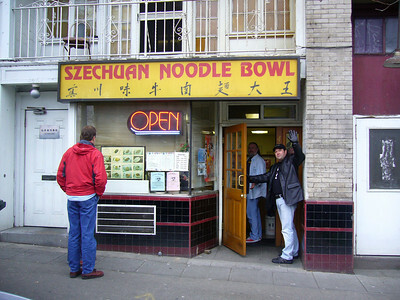 but as of now, as much as i love Pho Bac, i'm thinking i'm going to be heading for szechwan instead. Given the dingy, cafeteria setting, I did not expect much. I was wrong. Our table shared Green Onion Pancake, Pork Wontons, and I had the shredded chicken noodle in soup. The Green onion pancakes were the best I’ve had, crispy fried on the inside and soaking up sauce perfectly. The wontons were flavorful and the wrap was fresh. My soup was in a tasty chicken broth, not spicy, with fresh steamed baby bok choi and chicken breast with the round buckwheat noodles. It was warming and delicious and I could only eat half. I will more than likely go back to have this soup again. Four Chopsticks. I'm torn on Szechuan Noodle Bowl. On the plus side, their green onion pancake was quite good and when I ordered the vegetable noodle with soup they asked if I wanted veggie or meat broth, which is always a good sign to me. On the minus side, the soup turned out to be just noodles and bok choy and broth; everyone else's bowls consisted of noodles and bok choy and broth and meat -- it would've been nice if they'd swapped in something else for the meat, like mushrooms or tofu. I did think that, by themselves, the noodles were chewy goodness and the bok choy was fresh and the veggie broth was pretty solid, but all together the dish didn't add up to something greater than the sum of its parts. The veggie broth didn't have much kick to it, either, but spooning in some hot sauce fixed that. All in all, I don't feel particularly compelled to order the vegetable noodle with soup again, but there's at least one other main veggie dish to try, as well as the veggie dumplings (which, I suppose, could be a main dish in and of themselves -- 10 pieces per order!). So, if some other dish clicks for me, I'd easily bump my rating up to 4. I need a ghost writer if you expect me to contribute to this blog. Hahaha, you're all such n00bs to lunch/dinner clubs! You need to all order something different--that's the primary rule--and eat family style. When you tell the waitstaff that's what you're doing, you'll each get small bowls for pouring soup into, and small plates for for other dishes. That's the beauty of Asian restaurants, especially. For us readers, it's totally boring to have folks rave about the exact same dish over and over. Help us out, folks! 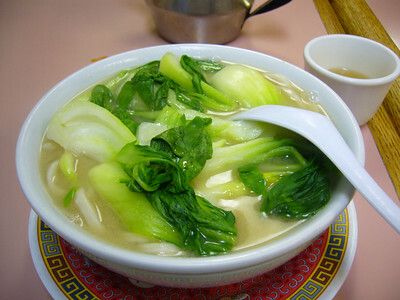 On the minus side, the soup turned out to be just noodles and bok choy and broth; everyone else's bowls consisted of noodles and bok choy and broth and meat -- it would've been nice if they'd swapped in something else for the meat, like mushrooms or tofu." Veggies are always bitching about something in the world of food. Glad to see that proud tradition continued here. This blog is totally awesome! Reading my way thru now. Thanks for some sweet tips. The horse photo mystery solved thanks to my neighbors Michael and Daniel. The jr. high school girl responsible is Bre Pettis (http://brepettis.com/) and is, in fact, not a jr. high school girl at all. Our family loves the Szechuan Noodle Bowl. 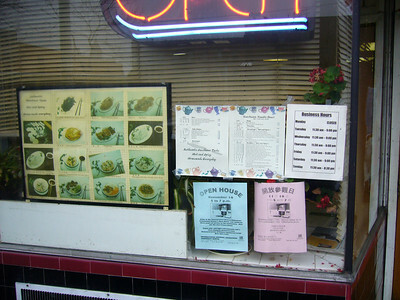 Here are our favorites in order of yumminess: Green Onion Pancake, Spinach & Tofu dumplings, chicken & rice, baby bok choy. Yum! Another delicious lunch at Szechuan Noodle Bowl today. I asked about the thick fresh, homemade tasting noodles in their soup and found out that they are custom made weekly by the Tsue Chong noodle company next door. This reminded us to stop by and pick up a bag of unfortunate fortune cookies for the office. Just thought you might want to note that they only take cash.